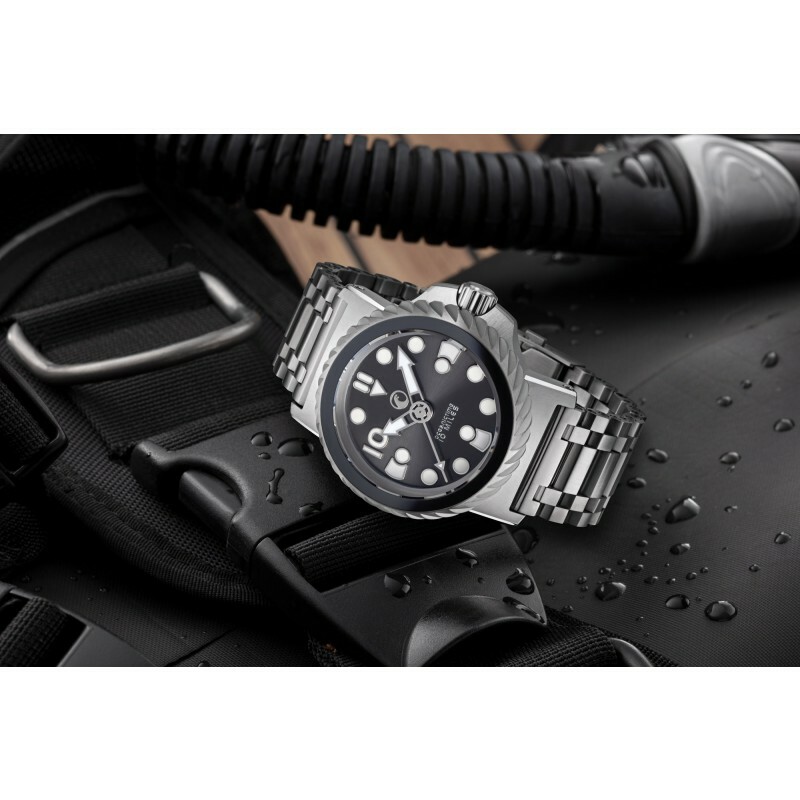 H2O KALMAR 2 OEANICTIME 10 MILES H2O Watch of Germany and British, dedicated dive watch blog, OceanicTime celebrate a 10 year milestone with a depth defying, high water-resistance wristwatch. 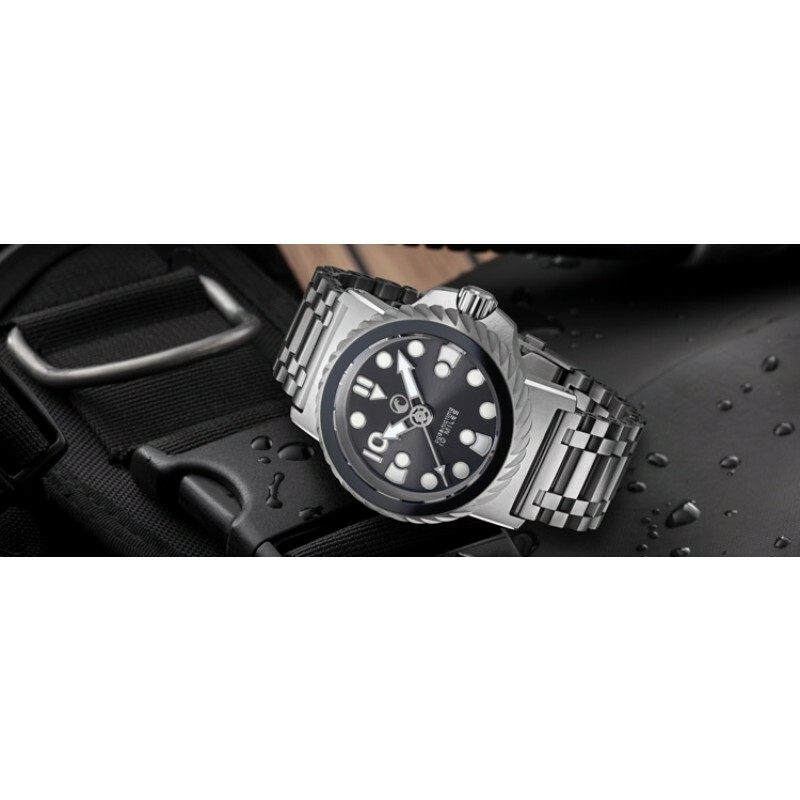 The H2O KALMAR 2 OEANICTIME 10 MILES has been engineered to outperform even the most waterproof experimental wristwatches as well as the deepest diving deep-sea submersibles, by miles! KALMAR 2 The 10 MILES is based on H2O Watch’s flagship diver’s model, the second generation Kalmar, the Kalmar 2 which boasts a re-engineered case architecture, designed using advanced FEM software – as simply increasing its case-back and crystal thickness would not have been sufficient to achieve the staggering 16’093 meters of water-resistance that the 10 MILES is officially certified to. Taking its name from the German for Giant Squid; a creature that can measure up to 13 meters long and that inhabits a dark world thousands of feet below the waves, the first generation Kalmar, released in 2011 was officially tested to 600 bar, the equivalent of 6’000 meters of water-resistance. Its successor, the Kalmar 2 was created as a Special Edition in 2015 for the OcenicTime blog and was able to gain 2’000m on its older sibling with an incredible depth-rating of 8’000 meters! 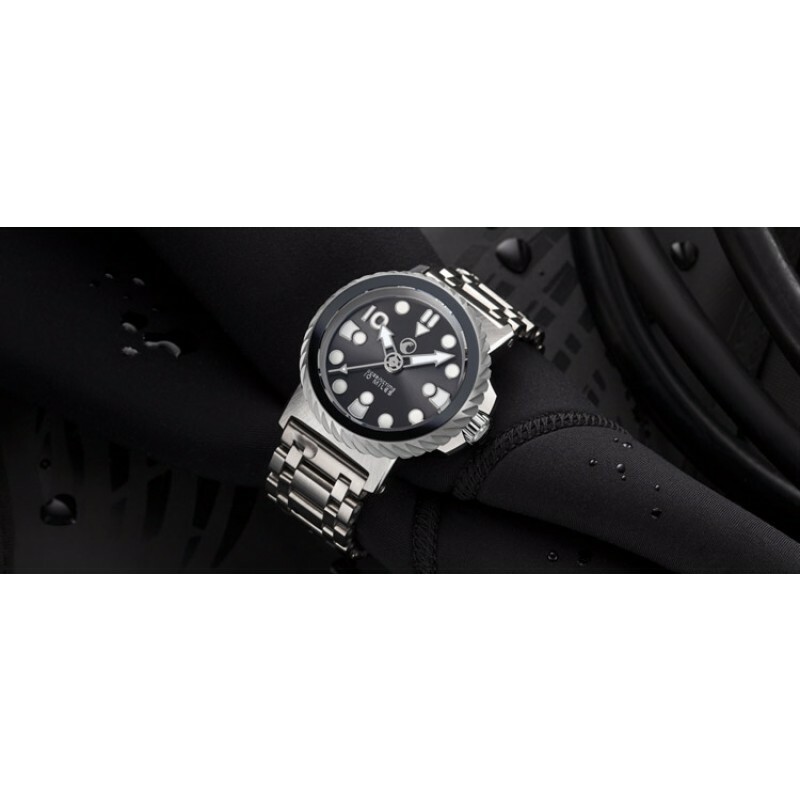 The 10 MILES has now, more than double that with its 16’093m depth-rating, and is a good 4’000 meters more water-resistance than any famous Swiss brand’s experimental wristwatch – it is the deepest diving mechanical wristwatch ever built! 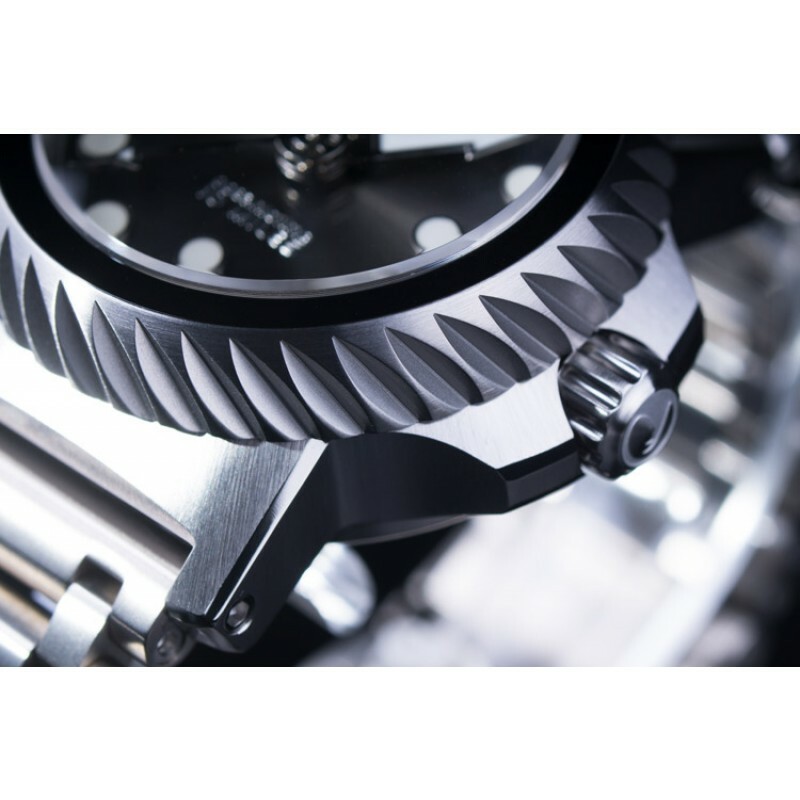 Ti GRADE 5 Grade 5 Titanium is H2O Watch's case material of choice for projects such as the 10 MILES; their engineers favor the aerospace-grade material for its increased tensile strength which makes it almost twice as strong as 316L Stainless steel yet 40% lighter. For reference, Titanium Grade 5 has a hardness of 349 Vickers. By comparison 316L Stainless steel has a hardness of 152 while Titanium Grade 2 is 149 Vickers. Another benefit of Titanium is that it is hypoallergenic, meaning that, it will not react with your skin to cause irritation. SAPPHIRE The 10 MILES is fitted with a domed scratch-resistant sapphire crystal with a multi-layered anti-reflective treatment on its inner side. The sapphire crystal is only second to diamond in its hardness, scoring 9 out of 10 on the Mohs mineral hardness scale. Grown synthetically in cylindrical sticks called boules, the production of a sapphire crystal is a slow, expensive and energy-intensive process. 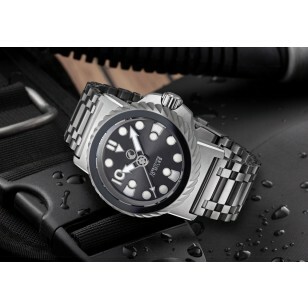 H2O Watch select only the very highest quality crystals for their watches as even the slightest imperfection in the crystal could result in a catastrophic breach of the watch case – if you were ever to find your 10 MILES watch in such an extreme environment. The 10 MILES is offered with a choice of 8.25mm or 10.50mm thick sapphire crystals. The choice is purely an aesthetic one as both our crystal easily surpassed the watch’s 16’093m depth-rating. FEM The 10 MILES watch owes its phenomenal level water-resistance not only to its generous use of use high-tech materials, like the aerospace-grade Titanium used for its case architecture but also to the use of ‘’finite element analysis’’ (FEA), a computerized method for predicting how a structure reacts to real world physical effects; in this instance a watch case’s tolerance to extreme pressure. 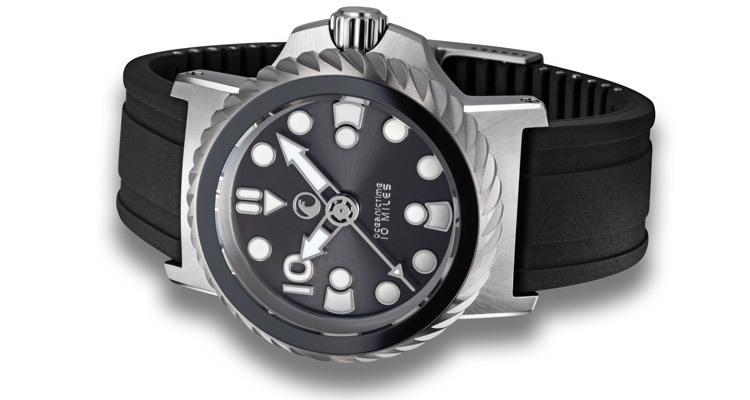 With the help of ‘’finite element method’’ (FEM) software H2O Watch’s team of engineers were able to model the 10 MILES watch case in a virtual environment, in order to find and solve any potential (or existing) structural or performance issues even before subjecting it to 1’600+ bar of pressure. REACHING 10 MILES In addition to re-engineering the case architecture of the Kalmar 2 (already bolstered with a substantial crystal and case-back) using FEM software, removing any potential areas of weakness such as its Helium Escape Valve (often mistakenly thought to be an important feature of a deep diver’s watch), the 10 MILES uses an advanced crown-system with 4 gaskets, sealing the crown from external pressures. Even the crown-tube, itself has been sealed with a gasket, and then glued into the case using the strongest industrial-grade metal glue, available! The case-back is sealed with dual VITON® gaskets, which are extremely resistant to chemicals and salt-water and are highly pressure-resistant. 10 MILES DEEP Located in the western Pacific Ocean is the Challenger Deep, the deepest point in the Mariana Trench which is just under 7 miles (6.831 miles) or 10’994m deep. The H2O Watch x OCEANICTIME 10 MILES could easily survive such an extreme environment, without issue, but to simply survive was not enough. In order to ensure that the 10 MILES would fully comply with the industry norms for a certified diver’s watch (that require an additional 25% buffer beyond the stated water-resistance), it would need to exceed 11’000 meters by 25%, thus creating a new target depth of 13’750 meters. H2O Watch’s engineers had already predicted that 15’000+ meters was achievable – so with some additional engineering the watch was on course for 16’093 meters AKA 10 MILES. When the time finally came, 2 pieces of the 10 MILES production watches were taken for independent pressure-testing in Germany. TESTED to DESTRUCTION The 10 MILES watch was independently pressure tested and officially certified in a specialist German research facility, the only facility of its type in Germany capable of pressure testing up to 4’000 bar, the equivalent of 40’000m. It was tested with two different crystal set-ups, firstly with an 8.25mm crystal that finally succumbed to 2’530 bar of pressure, the equivalent of 25’300m of water-resistance. H2O Watch’s engineers were not expecting the crystal to perform so well, so had prepared a second watch fitted with a thicker, 10.50mm crystal which surpassed the 8.25mm crystal only by 32 bar. It was finally destroyed at 2’562 bar, the equivalent of 25’620m of water-resistance. As a testament to this outstanding level of pressure-resistance, all 10 MILES watches bare a discreet ‘’25300M CERTIFIED’’ engraved hallmark between their lugs. DIAL Offered in DARK ANTHRACITE the dial of the 10 MILES has been designed for optimum legibility; both date aperture and minute track are noticeably absent. Instead large professional-style appliqué indexes with chrome surrounds dominate the dial, an H2O Watch signature, disrupted only by the presence of a single Arabic numeral, the ‘’10’’ whose presence is more than a simple quirk. A specific design feature, the “10” not only relates to the 10 MILES name but once again to OceanicTime’s 10 Year Anniversary which coincidentally fell on the 10th month of this year. 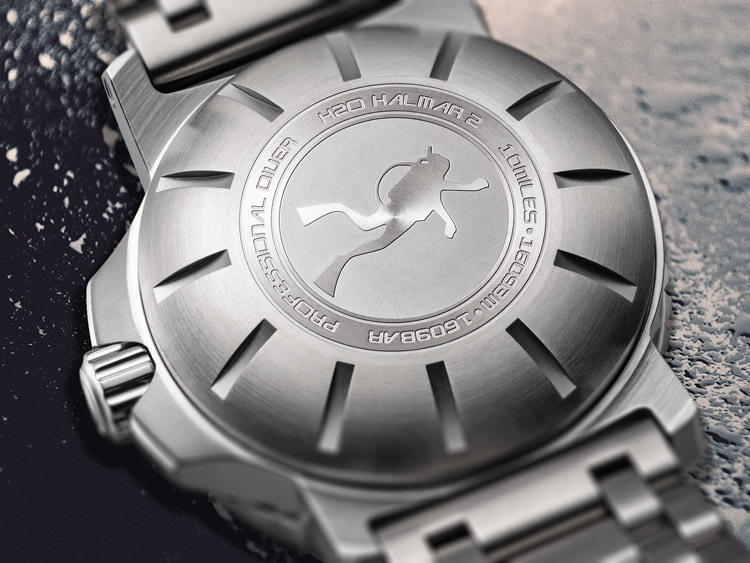 Matching the chromed indexes are a set of chromed arrow-head hands and the H2O Watch and OCEANICTIME logos as well as the ‘’10 MILES’’ name / water-resistance text. All hands and dial markers of the 10 MILES watch have been generously filled with Swiss Super-LumiNova® BGW9 which emits a bright blue light. A MILESTONE The significance of “10 MILES “which can be found proudly on the dial at the 6 o’clock position, under the OCEANICTIME name and again on the case-back, where it refers more specifically to the watch’s almost preposterous level of water-resistance, also refers to a decade of blogging. 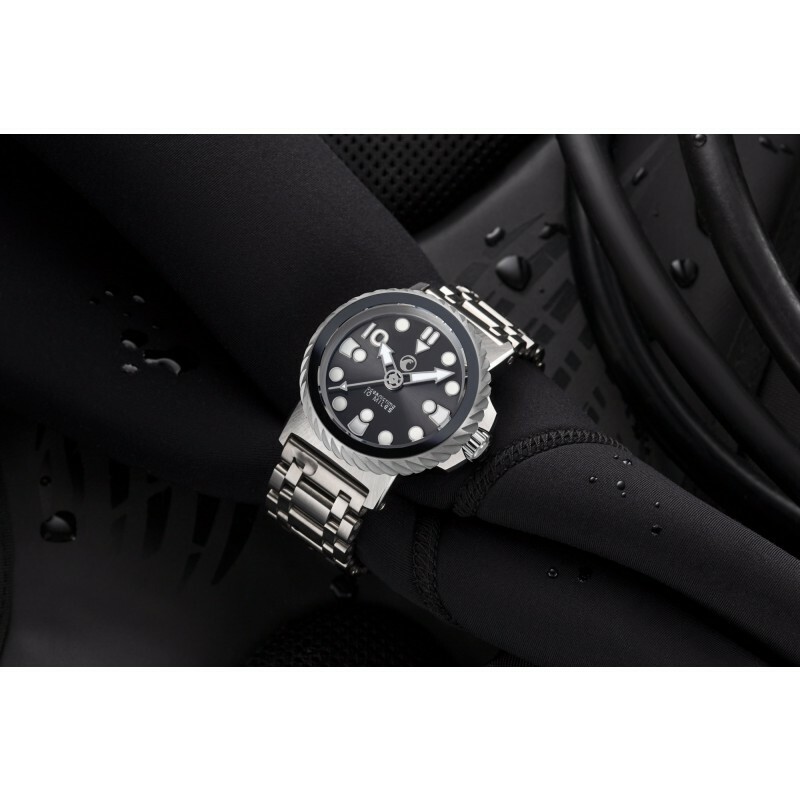 The well-known blog dedicated to diver’s watches, OceanicTime, famous for its daily insights into the world of subaquatic horology posted its first article in 2008. 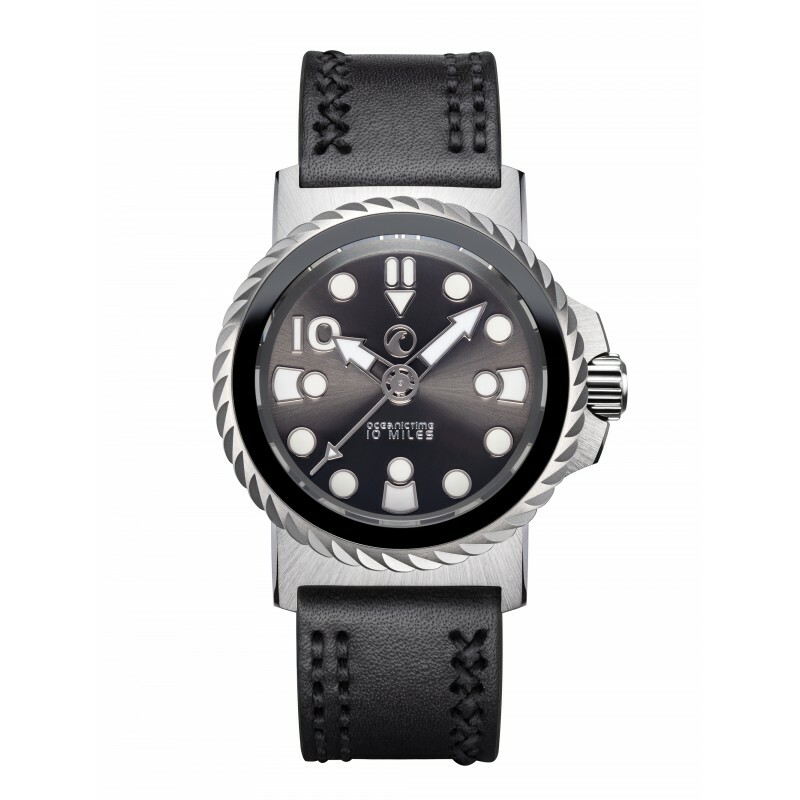 Besides its daily forecasts on the dive watch industry, it is also known for its annual collaborative projects AKA OceanicTime Special Editions where it takes a model that is already in production and seeks to enhance its aesthetics, improve its water-resistance and upgrade its movement. With several successful projects already under its belt, 2 of which were with H2O Watch, OceanicTime once again looked to the German depth specialist to create the last word in water-resistance to celebrate its 10th Anniversary. MOVEMENT What makes the 10 MILES so extraordinary is that locked within its hermetically sealed vault-like case, it houses a Swiss made, self-winding mechanical movement. This is no oil-filled, quartz-powered, pretender! Powering the 10 MILES is a Swiss made ETA 2892 ELABORE automatic movement with. 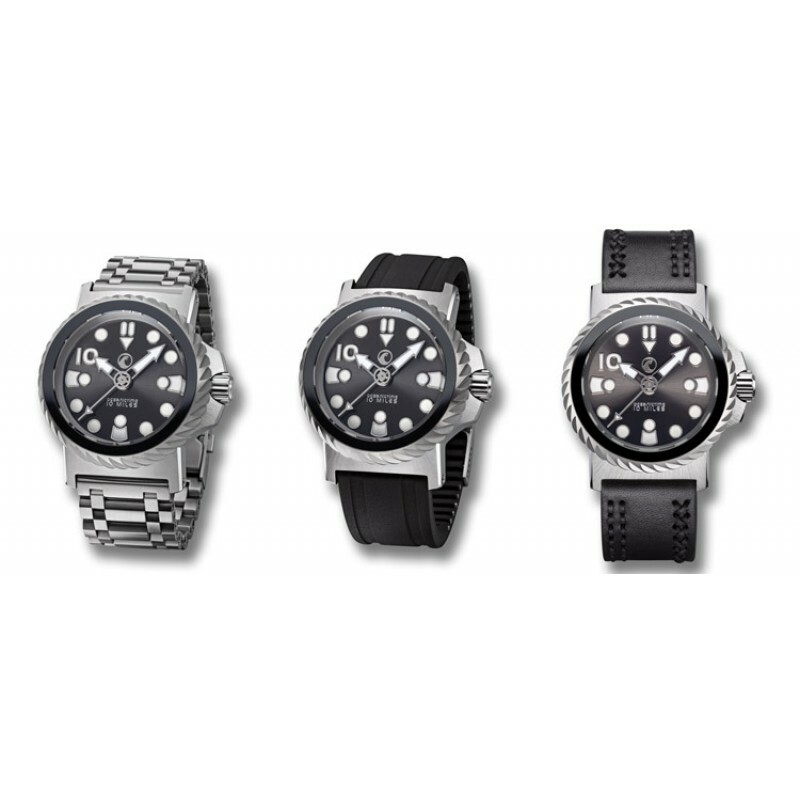 Each watch is individually regulated by a German watchmaker for increased accuracy and precision. Its functions include: hours, minutes and sweep and hacking seconds. “There is no such thing as over engineering, there is only understating. This is why our new 10 MILES watch states a depth-rating of 16’093 meters but was in fact engineered to reach more than 25’000 meters! “Extreme water-resistance has been a fascination, since I bought my first mechanical watch with a water-resistance of 1524m. 20 years on, I find myself involved with a watch boasting more than 10 times that! THE WATCH Compact, lightweight, refined yet understated (in more ways than one), we hope that this brawny yet stylish little fellow, our 10 MILES watch will be able to accompany you on all of your adventures. Wear it over neoprene for a deep dive, wear it up against the cuff of a woolen sweater this winter or show it off on a tanned wrist on a hot day. The 10 MILES watch wasn’t only engineered for the deep; we wanted it to be worn and enjoyed as much as any of our other models. Unlike so many unwearable high-water-resistant watches that are confined to the watch box, the 10 MILES has been designed to sit comfortably on your wrist. 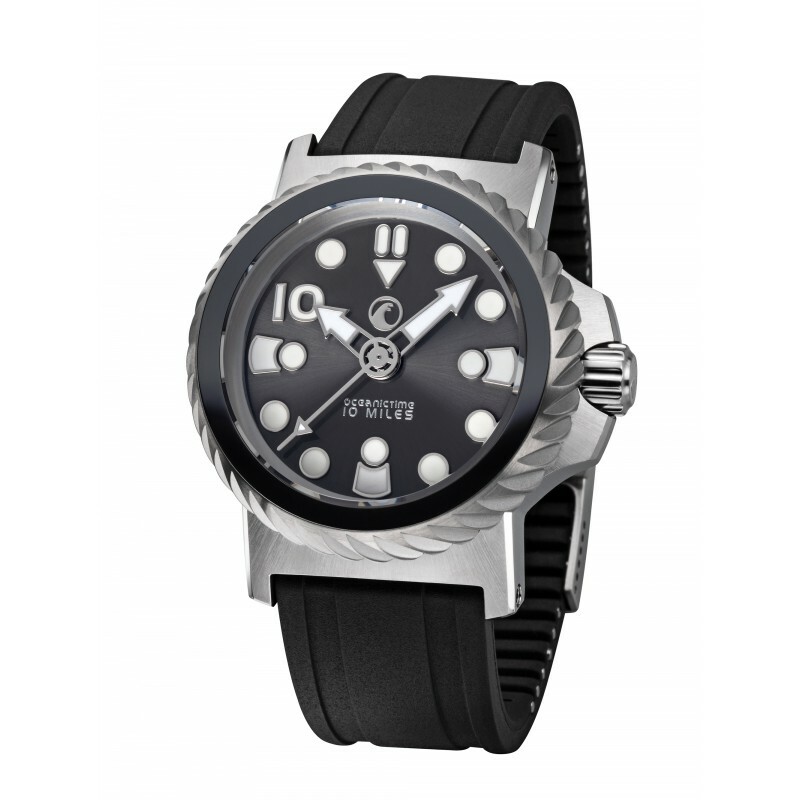 DEEP BLACK In addition to the regular 10 MILES watch, a special DEEP BLACK edition presented in a classic OceanicTime monochromatic livery is also available. For the DEEP BLACK edition, a high-quality German DLC (diamond like carbon) surface treatment has been applied to the 10 MILES’s; bezel, crown and case-back offering additional scratch-resistance along with classic OceanicTime contrasting case components. H2O WATCH Based in Sottrum, a stone’s throw from Bremen, a major Northern German cultural and economic hub and home to dozens of historical galleries and museums, such as the Übersee-Museum, H2O Watch was founded in 2010 by Clemens Helberg. H2O Watch and its sub-brand, HELBERG are specialists in the production of high-quality, German built, luxury mechanical wristwatches; robust yet stylish, their timepieces not only push the envelope in terms of high-levels of water-resistance in which they are already an industry leader but in their use of exotic case materials and cutting-edge, case hardening technologies. 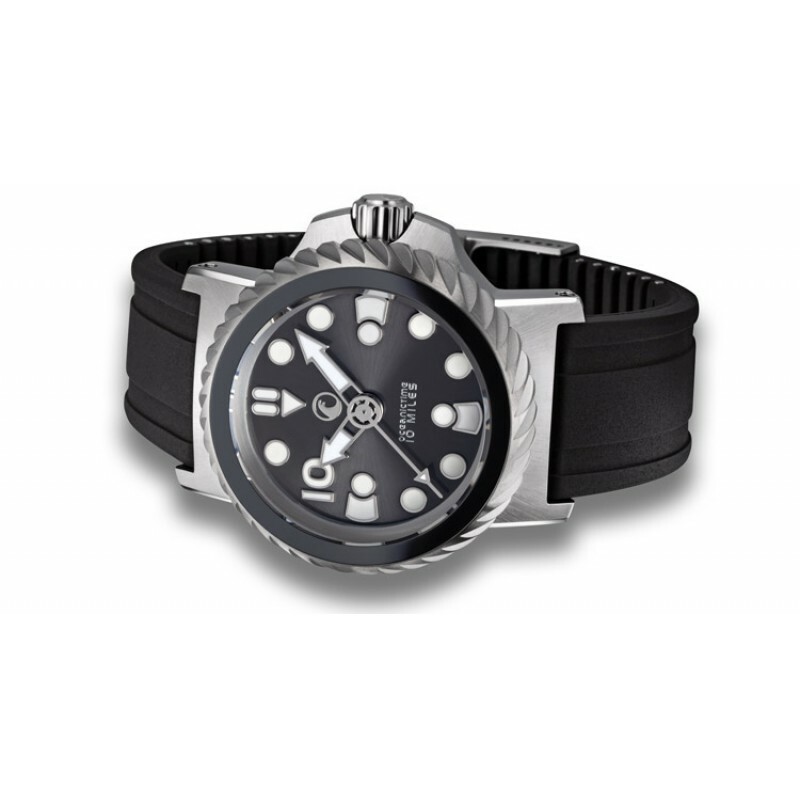 Besides this H2O Watch offer their customers an unprecedented level of customization with the use of their online smart-configuration tool that allows you to pick and choose from a plethora of watch components, so that you can create the perfect wristwatch. 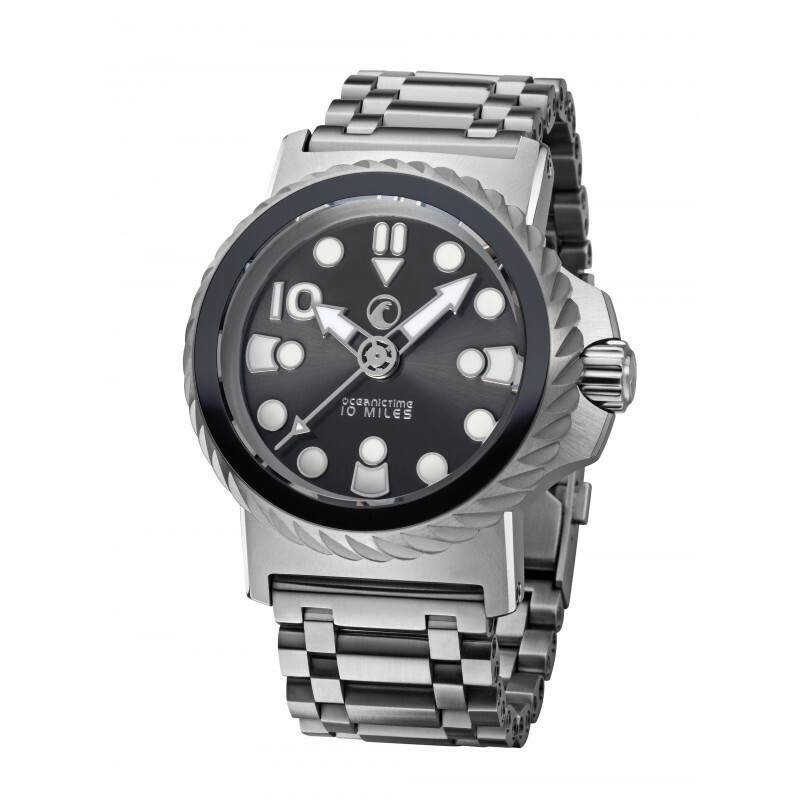 OCEANICTIME OceanicTime is a well-known blog dedicated to diver’s watches. It was founded by British writer and dive watch aficionado, Lex Martine in 2010. 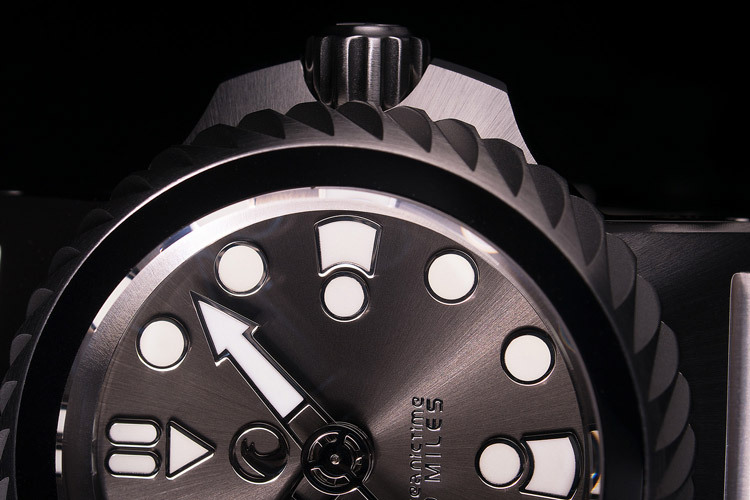 Besides its daily blogs on the dive watch industry’s latest and greatest and its in-depth watch reviews, it is known for its special collaborative projects with up and coming diver-centric watch brands. 2018 marks its 10 anniversary.